It's a Surprise Party for Moms! Moms! Moms! Hooray for Moms! This Sunday, May 9th many families will be taking time to thank their moms for being so supportive, generous, and loving. Mother's Day will always hold a special place in my heart because my daughter was born on Mother's Day. Now our Mother's Day weekends are often crazy with her birthday celebration and Mother's Day festivities. In this Mother's Day edition of Surprise Party, I am pleased to introduce you to a mom and author, Sherry Ellis. Sherry has published two books about her experiences being a busy mom. I will be highlighting her first book That Baby Woke Me Up, AGAIN. Also, just released this week is her latest book called That Mama is a Grouch . Both books are available on Amazon.com . That Baby Woke Me Up, AGAIN! is a book told from the point of view of the oldest child in a family with a new baby. The baby is having trouble sleeping and his cries (WAAAAH!) are waking everyone up! The little girl's dreams are interrupted. She resorts to counting sheep. Eventually, morning comes and she wakes up with bags under her eyes. However, she is not upset (lucky for mom!). She only wonders why the baby wakes up so much. Her mom explains that there are many reasons why babies cry and reassures her that the baby will soon sleep through the night. The book ends with the mother reminiscing about the little's girls troubles sleeping when she was a baby. I read this book to both my kids and they loved it when the baby cried. It was quite humorous to hear them add their "baby cries" at the appropriate time while reading the book. Additionally, we were able to have a discussion after the story about the possibility of our new addition keeping everyone up at night. My kids were able to understand that all babies cry and that they often woke everyone up at night too. Even though this discussion went well, I have a feeling that I will be pulling this book out again very soon! I have always felt that children are able to learn social and emotional concepts more effectively from books. Just talking about an situation never seems to have as much impact as reading a book first and then talking about scenario. Additionally, you can always refer back to the book if needed. (i.e. Do you remember what happened in that book we read?) That Baby Woke Me Up, AGAIN could be a very valuable tool in bringing harmony to a home that has older siblings and a new baby. Happy Birthday Author: What is the story behind That Baby Woke Me Up, AGAIN? Sherry Ellis: My kids were terrible sleepers when they were babies. For the first two years of their lives, I got no more than four hours of sleep a night. Many nights I didn’t sleep at all. Believe me, I tried every method out there to get them to sleep. Nothing worked. One night, at about three o-clock in the morning, I was sitting in the rocking chair with my son. A poem started going through my head. It was the beginning of That Baby Woke Me Up, AGAIN! Every time he woke me up, I’d add a little more to the story in my head. After about a week, I had the whole thing composed. I wrote it down to share with my daughter. She thought it was funny. It was she who suggested that I get it published. Thus began my career as an author. Happy Birthday Author: Can you describe the feeling you had when you saw your book published? Sherry Ellis: It was exciting to hold the first copy of my book, and see the story come to life through the illustrations. I think that gave me the desire to keep writing. Happy Birthday Author: I noticed you have a blog, Mama Diaries, Do you have plans for this blog? Sherry Ellis: My blog, Mama Diaries, is a daily account of some of the funny things my kids do, and some of the memorable things that happen in my life. It’s a way for readers to learn a little about me and connect if they wish to do so. It also serves as something to help me remember things about my kids long after the season of childhood has passed. As far as plans for my blog – I really don’t have any intention of publishing it as a book. If I do, it would just be something to share with my kids when they got older. If anything, it could be a source of inspiration for future stories. I’ve already had a reader suggest a story based on one of my posts. Happy Birthday Author: In addition to That Baby Woke Me Up, AGAIN! , I noticed you have another book, That Mama is a Grouch. Could you talk a little about this book? 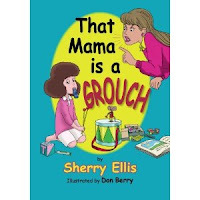 Sherry Ellis: That Mama is a Grouch was also inspired by an experience I had about five years ago. I was in my sleep-deprived state hauling a basket of laundry though the family room. I tripped on one of my daughter’s toys. Laundry went flying and I ended up whacking my foot against the side of the sofa. The result was a broken toe and one very grouchy mama! I imagine that toy-strewn houses are quite common, so I decided to write a book about it. It’s a funny story that appeals to both kids and adults. My hope is that kids will find inspiration to clean up their messes so that parents will have fewer grouch attacks! Happy Birthday Author: What are your plans for the future as an author? Sherry Ellis: As far as future plans, I am working on quite a few projects. I have written several manuscripts for picture books. I have also started working on a series of chapter books for young readers that are similar in style to Mary Pope Osborne’s Magic Tree House Series. These books are going to incorporate a little history, a little culture, and a little adventure into the stories. Another neat project I have started, is writing music for Tom and Tess Hannah’s poetry in their book, The Endless String. Perhaps there is a children’s CD in the future as well! Happy Birthday Author: That is very interesting about writing music for Tom and Tess Hannah. I just celebrated a Surprise Party for them last week. What are the chances of that! Happy Birthday Author: What routines of reading did you have for your children? Sherry Ellis: Fostering a love of books with my children is very important in my house. We have a bed time ritual where I read one or two stories (or chapters to my older daughter). Then we make up our own. I start and idea and then ask my children to add to it. It only takes about five or ten minutes, but it’s so much fun! My kids look forward to it every night. Happy Birthday Author: I love the idea of having them finish a story you started. I am going to have to try that with my children. Happy Birthday Author: When is your birthday? Happy Birthday Author: Do you have a favorite a birthday memory or tradition? Sherry Ellis: My mom was a fabulous baker and cook. Every birthday she would bake a delicious cake, and I would get to choose what I wanted for dinner. Almost every time, I would choose her Hungarian Chicken Paprikas. I looked forward to it every year. Happy Birthday Author: Any additional information that you think the readers of my blog would like to know? Advice for new moms? Sherry Ellis: Enjoy each season of motherhood as much as you can. I know the sleep deprivation, dirty diapers, and messy rooms can be a drag – I’ve been there! Just try to remember that the film of childhood plays only once. Be there for your kids and have fun! Visit Sherry Ellis on Facebook and her website www.sherryellisbooks.com. 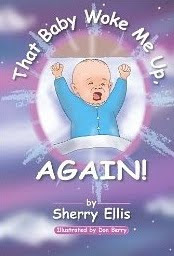 Sherry Ellis has generously provided an autographed hardcover copy of That Baby Woke Me Up, AGAIN as a giveaway to one lucky reader of Happy Birthday Author. Post a comment to this article to qualify for the drawing and maybe even wish your mom a Happy Mother's Day! You can even receive an extra entry if mention that you shared the information about Sherry Ellis and her books (Twitter, Facebook, Word of Mouth). Good Luck - this book would make a great gift for an expecting mom! Deadline for entry is Friday, May 14. Make sure you leave email information. Before I go - I must wish Happy Mother's Day to my Mom who reads all of my posts and actually encouraged me to promote my blog. Also, Happy Mother's Day to my wife - you are great mom and I love you! What is a Surprise Party? It is a break from the birthday celebration posts that normally occur on this blog. It gives a chance for the readers of this blog to meet newly published authors. But, in the spirit of the blog we always discuss birthdays in the author interview portion of the post. If you are an author of a children's book and would like to be featured as a Surprise Party guest email Eric at happybirthdayblog@att.net. Disclaimer: I was not compensated for the writing of this post. However, I did receive a book from the author to aid me in writing the post. The blog does receive a small percentage from Amazon.com purchases. My niece is due with her first any day. This would make a great gift! 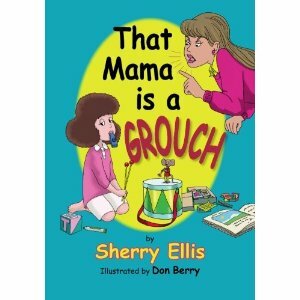 I am going to order Sherry's new book, That Mama is a grouch" now. I have been waiting for the release! Sounds so relevant to my life! Getting an extra copy would be great, because I have a lot of nieces and nephews and their parents would love it too!! This looks like a great book I'd love to share with my daughter! Sadly, I think my 3 year old can relate to this story although my son is getting better at sleeping! Thanks for the opportunity. I like that your book blog is a bit different! This sounds great! Please enter me. sounds like a cute book. I love children's books. This looks like a sweet book! My little girl would love it! This contest is closed. Congratulations MJ for winning this Surprise Party Giveaway.